Size of Male: 25-35 lbs., 17-20 in. Size of Female: 25-35 lbs., 17-20 in. The German Pinscher is a rare breed but they have been in existence for around two centuries. They were very popular as vermin hunters in the 19th century. Highly intelligent, this dog breed needs firm but gentle dog training. They are willing learners and make excellent family companions. The German Pinscher is one of the foundation breeds for the Doberman Pinscher, the Miniature Pinscher and other pinscher-type dogs. However, the German Pinscher is actually more closely associated with the Standard Schnauzer. In the mid-19th century, when this breed was developing, wire-haired dogs appeared in the same litters and these would later become the Standard Schnauzer. This pinscher dog breed has always been known for its outstanding skills as a vermin hunter. They also have a strong desire to protect their home and family. Like many other breeds in Europe, they nearly became extinct during the two World Wars, but dedicated breeders have saved the breed. However, the genes for a few colors and color patterns, such as harlequin, have been lost. 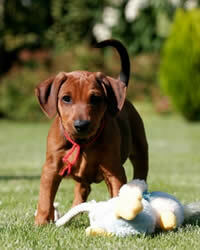 The German Pinscher is a highly intelligent breed and they are usually eager to learn. They are a hard-working breed with natural hunting ability. They also have an instinctual desire to protect their home and family. They can be quite territorial so they should be socialized from a young age to help them be more accepting of friendly strangers. They can be barkers if they think the family needs to be warned. They usually get along well with other dogs, but they have a strong prey drive and they will chase and kill cats and other small pets unless they are well-socialized with these animals from a young age. These dogs love children and will protect them. This is a loving and affectionate breed and can be possessive of their owners at times. It’s best if these dogs receive dog training from the time they are puppies so the owner will always be in command since they can be strong-willed and stubborn. This breed makes a good family pet with consistent firm and gentle training and discipline. Living Environment – The German Pinscher is quite active but they can adapt to living in an apartment if you provide them with plenty of exercise each day. They will also enjoy having their own yard. They do not do well as kennel dogs since they want a job to do and they want to be with their owners. Grooming – Grooming for this breed is fairly easy. They have a short, dense coat that needs to be brushed about once a week to remove dead hair. They are average shedders. Diet & Exercise – Dietary requirements for this breed are considered normal and they do need a great deal of daily exercise. They are a very active breed and should be taken for long walks. They will prefer to have a place to run off-leash. If they are allowed to run off-leash you should make sure the area is safe and enclosed. These dogs may take off after small animals and they may not return when you call them. Health – In the health department, this dog breed can be prone to cataracts, canine hip dysplasia and elbow dysplasia, von Willebrand’s disease, thyroid problems and cardiac issues. If you are interested in this breed you should talk to a breeder about possible dog health problems. In the dog training arena, the German Pinscher is a highly intelligent dog and they are willing learners. They can be strong-willed and stubborn at times. According to the breed parent club these dogs can be manipulative and intent on getting their own way. They may become bored with basic dog obedience training unless you are creative and make it interesting for them. Try to keep things fun and don’t repeat things endlessly. Once your dog has learned a lesson, move on to the next new thing. Use positive dog training with these dogs (praise, reward) and you should get good results.